If you were to look at the subtitle in the above banner of this blog you would see that I fancy myself a connoisseur of all things pop culture. While I realize that self-proclaimed title can appear presumptuous, I admit that there have been some things I've missed out on. Therefore, I thought I'd take this opportunity to out myself, not as a charlatan, but as someone who isn't capable of knowing every frickin' single movie, album, and TV show out there. I mean, nobody's perfect, right? Unless you're Roger Ebert or Leonard Maltin, chances are you, dear reader, haven't even seen half of the films in existence. Here's a short list of films that, to this day, I haven't had the chance to view. Go ahead. Drop those jaws. Scold me all you want. Let's get it all out, shall we? 1. Aladdin (1992) - The beloved Disney classic is one of the big ones that got away. 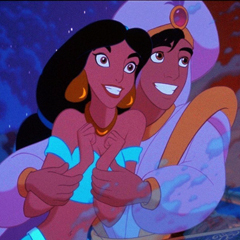 I was 12 when it came out in theaters, and although I did enjoy "A Whole New World" on the radio, I never familiarized myself with Genie, Jasmine, and the titular hero who, to me, looks a lot like a tanned, turban-wearing twin of The Little Mermaid's Prince Eric. 2. Braveheart (1995) - Back when Mel Gibson was a bankable box-office star I preoccupied myself with other things 15-year-olds enjoyed: The Brady Bunch Movie, reading Stephen King novels, and Alicia Silverstone. Historical battle epics wasn't one of them. 3. Manhattan (1979) - One of two films on this list that was released before I was born, Woody Allen's black-and-white love letter to the city I love (and grew up near) was lost on me. I do plan to watch it someday and see what all the fuss is about. 4. Annie Hall (1977) - See item #3. 5. Philadelphia (1993) - I had friends in high school who swore by this drama, which nabbed Tom Hanks his first Oscar. The subject matter may have been a bit out of my demographic at the time (I was 13), but now I'm feeling the shame for never catching up on this cinematic slice of social commentary. 6. Terms of Endearment (1983) - This is the one where the daughter dies at the end, right? Thanks, but I've already seen (and own) Steel Magnolias. 7. Boyz in the Hood (1991) - A crime drama set in the mean streets of South Central Los Angeles did nothing for me during my summer after fifth grade. My apologies to John Singleton. 8. Some Kind of Wonderful (1987) - Or as I like to call it, The John Hughes Movie I Missed. And you know I appreciate some Lea Thompson and Mary Stuart Masterson. I'll let you know if I come up with any more. Till then, who wants to lend me some DVDs? First of all, Some Kind of Wonderful, is my favorite John Hughes movie and yes, you can borrow the DVD. Secondly, the only reason that I've seen Braveheart as many times as I have is because the boy I was in love with in high school loved it and had it memorized. He recited almost the entire thing to me once. He also recited the Princess Bride from memory which was much more romantic. The ones I've never seen from this list: "Braveheart," "Manhattan," "Annie Hall," "Terms of Endearment," (add "Steel Magnolias" to my list...) and "Boyz in the Hood." I feel better knowing you've never seen them either! I have "Aladdin" on VHS - you're welcome to fly to Boston so we can watch it together. Assuming I can figure out how to set up our VCR!